There has been a lot of buzz about tmux recently. The fine pragmatic programmers folks published a very good book about it and on twitter, at least on my stream, there are a lot people in love with it. Actually, I run into it for a real word need (I’ll explain this later) and I found it incredible useful in a lot of other situations. So, I would like to share them with you. I assume you already know what tmux is, it’s pointless to write again what could easily find somewhere else. Indeed, there are a lot of interesting resources out there for an introduction to tmux. So, what I’m trying to do with this article is just offering the point of view of a Rails developer who is actually using tmux daily. Yeah, I know. It looks like a stupid point. But it really isn’t. It doesn’t make sense at all to give tmux a try if you’re not using the terminal all the time. It’s not a strict requirement but trying something that will speed up your productivity with something you don’t use it’s really pointless. If you already read something else here on my blog then you know that I love Vim, so if you, like me, are a Vim user you’re lucky. But that’s not the real point. You need a whatever editor that works fine in the terminal. So, if you use some fancy editor (or some super-fancy IDE) that doesn’t work well in the terminal you can stop reading this article. You’re wasting your time here. Well, this is the real question, right? I have my simple answer: tmux will help you to stay totally focused on what you’re doing. Plain and simple. I talked to people that were saying “I don’t know. It really is that better than switching terminal tabs? Or switching applications?”. It’s a fair point but the answer is “Yes, it is better”. In my experience, there is always a context switch when you have to read why a test is failing or you have to read the log or you have to open up a terminal tab or you have to… OK you got it. Tmux has this killer feature that responds to the name of panes. They are better that windows because you really don’t have to switch a context, what you’re looking for is already there. It’s a tiny difference but it’s a very important one. Furthermore, tmux has a lot of keyword shortcuts. Fortunately, you can configure them because I found them a bit crappy (read crappy as extremely difficult to remember). And you don’t have to forget that each single pane is an entire terminal session. It’s obvious because tmux is a terminal multiplexer but it’s not that obvious to have this opportunity with another software if you really think about it. Panes are not all tmux has to offer. There are windows and sessions too. I personally use windows when I do want a context switch but you could find them useful for another reason. Sessions are the real word reason why I run into tmux. In this period, I’m doing a lot of remote pair programming. When we started to pair we tried a lot of different solutions combining video calling and screen sharing. But none of them worked well. These technologies are an amazing way of communicating with people but unfortunately they requires a very good connection to work fine. But, even when the connection is very good, there is another problem: you have to choose who types in the pair session because you can’t switch easily. And that’s very important for pair programming. So I did a bit of a research and I found that a lot of people solved this problem using tmux. And that is how I run into tmux. At first, I didn’t understood how tmux could help in such a situation. Then, I finally understood what tmux session are and how you can easily attach your terminal to an existing tmux session. I think that tmux is a perfect solution for remote pair programming. It’s fast, light (in terms of connection) and very easy to set-up. Someo days ago, some guy I respect a lot tweeted, with a note of sarcasm, that a book about tmux would be longer of the source code of tmux itself. Yes, nice and reasonable point. Indeed, I was very sceptical before I bought the book. My concern was I didn’t really need an entire book for such a tool. By the way, when I was approaching tmux for pair programming I was in real need of getting a working configuration quickly. The book is cheap and I thought reading it could have been a way to save time. I read it in two times, probably it just took a couple of hours to read it entirely but now I can say the book it’s absolutely worth reading it. It contains a lot of useful information, it’s well written and it is very cheap. So, if you’re interesting in knowing more about tmux, just buy it. So each tab creates a window, there you can just run a command or create panes and run commands in them. Pretty neat. I’m very glad there is a pre option because, using gnome-terminal, tmux won’t behave correctly if it doesn’t assume it’s running inside a 256 colours terminal. tmuxinator is a good gem and there is some room for improvements too. For example, at this very moment there is no way to specify a socket name and it would be great to have it because using a socket name is a quick way to do some pair programming using tmux. By the way, I checked the pull-requests and there is a lot of nice stuff there (included a patch for the socket name). I recommend you to give tmuxinator a try, if you’re going to use tmux the odds are you’ll like this gem. I’m having a great time using tmux and I have the feeling it’ll become an indispensable tool for me. Sadly, there is always room for issues. The first issue I run into has been a good one. I didn’t ever spent some time trying to configure colours for my gnome-terminal because I was using the GUI version of Vim and there the colours are awesome. So, I had to spend some time tweaking the configuration of gnome-terminal. And now I have a very good looking gnome-terminal. All the other issues I run into are Vim related. First of all, I miss how beautiful look the GUI versions of some Vim features. Just things like underlined chars, bad-spelled words. The other issue is about mappings. Some of my mappings aren’t working in the terminal. Actually, the problem should be related to gnome-terminal but I didn’t investigated it yet. You’ll have some problem if you’re using MacVim and apple key mappings. They won’t work either in the terminal. I read a lot of people just remapped some stuff using the leader key. Actually, I have the feeling that sometimes is a good thing to embrace the uncomfortable. And, fot that very reason, I’m trying to do some od the stuff I was doing with that mappings in another way and I’m learning a lot of new stuff! Yes, re-reading the post I had the feeling I ended up talking about Rails specific stuff less than I thought while I was going to write it. 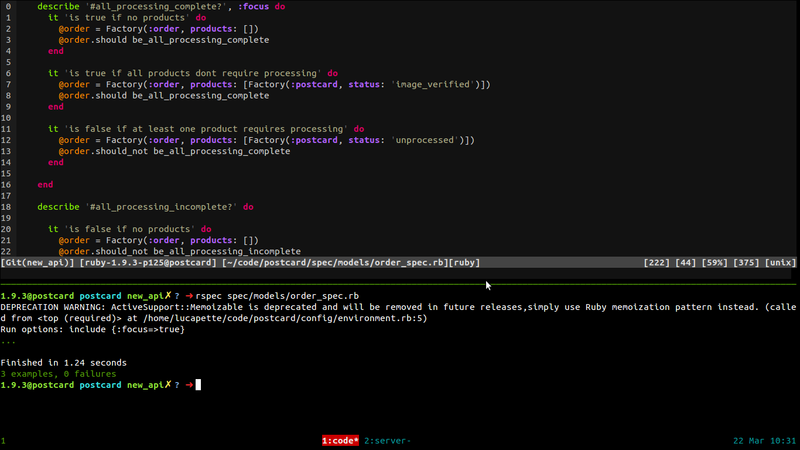 But, I can understand why: tmux isn’t specific to Rails, of course. It just fits very well with my personal habits. Furthermore, one of the most important thing I’m (still) learning living our profession is giving new stuff a try when I have the chance. Especially, when a lot of people are already trying or using the same stuff. So, give tmux a try if you’re using the console all the time. I bet most of you will really like it.